One of my strongest childhood holiday memories is Christmas shopping with my mom in the Bayshore Mall circa 1992, about four years after it opened. As a 10-year-old hayseed from Honeydew, the place seemed impossibly frenetic, even as my mom was impossibly efficient, pushing me and my little brother from store to bustling store as she gathered presents for our extended family. The thing that stands out most is when we veered too close to one of the kiosks in the middle of the galleria and a hopeful salesclerk tried to rope her into buying a Cathy calendar or Billy Ray Cyrus cassette tape or some other thing that was popular in 1992 and she said firmly, quickly, "No," as we hustled past. "No." It's a complete sentence. 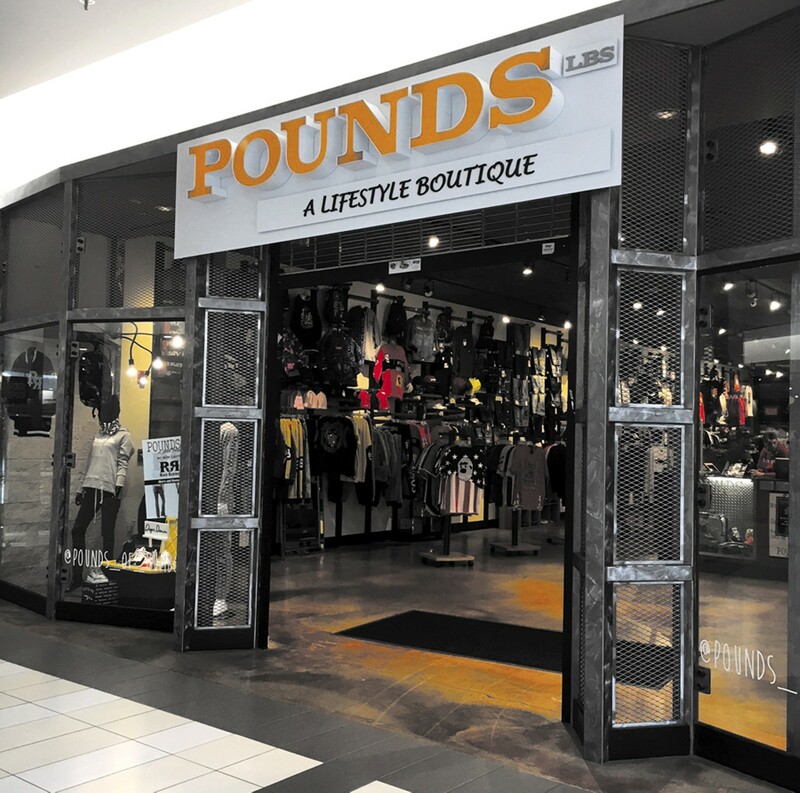 It's the same sentence I uttered when my sweetie and I made our own pass through the (much less bustling) mall last week and spotted a new store called Pounds: A Lifestyle Boutique. No. Just, no. But I was wrong. Like everything else around our region's most infamous industry, we have a weird relationship with how we market weed swag. Plenty of industry folks are pushing the earthy, crunchy, unbleached linen aesthetic of sungrown flowers and organic tinctures marketed to the Pinterest crowd with pictures of beaming family farmers. There's nothing wrong with that. 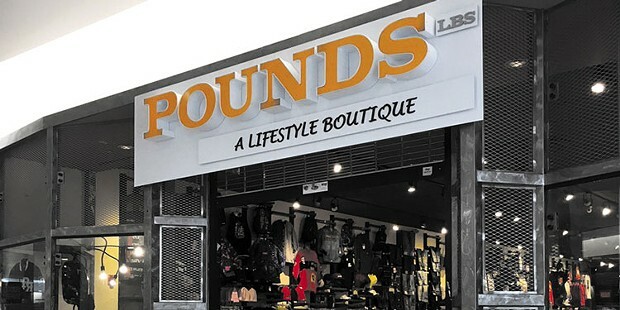 But on the other side of the coin, there's the stuff young dudes want, the stuff you can find at Pounds. 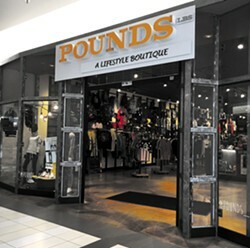 Like T-shirts, hoodies and hats that simply say "Pounds" or "Lbs." It might seem weird to see this at the normally staid bastion of family-centric shopping, but some of the stuff is not far from what you'd find at "edgy" corporate chain stores like Spencers or Hot Topic: novelty socks adorned with pizza and cannabis leaves, backpacks with high-looking cartoon characters. The balaclavas decorated with scary clown faces, calaveras and blood-covered skeleton teeth kind of threw me, but rich young dudes like to ski, and if some miracle gets me onto the slopes, I'm going to be terrified anyway. That is what they're for, right? Skiing? As a trio of 20-something guys talked about last weekend's party behind the sales counter, I contemplated a row of $20 baseball caps that say things like "Dabs and Pizza," "Buy Me Weed" and "You Can't Smoke With Us." Pretty solid. Politically conscious hip-hop (n-word bleeped out, f-word intact, lots of references to Trump) played over the store's sound system as a bank of screens on the far end of the store broadcast every move. A very new mother and her very stoned-looking significant other jiggled their baby and giggled over the "No Fuckboys Allowed" T-shirts. I silently prayed the baby wouldn't throw up on the $100 hoodie on the rack next to them. Novelty stuff aside, a lot of the gear is the kind of expensive fashion brands I consistently hear people say they have to go out of area to find. I'm not going to spend $300 on retro Air Jordans in "Golden Harvest," (that's the brand name, referring to wheat, not Pounds' own moniker) but I can't fault someone who wants to, especially if they want to do it locally. You've got to wonder, though, as the price of a pound has slipped to roughly $1,000, whether Pounds' key demographic is going to keep spending their harvest money on high-end kicks.